Jesuits Have Played Central Role In History Of The Church : The Two-Way The Jesuits are the single-largest Catholic order, known for their dedication to education and devotion to the poor. But in the past, they have also proved controversial. 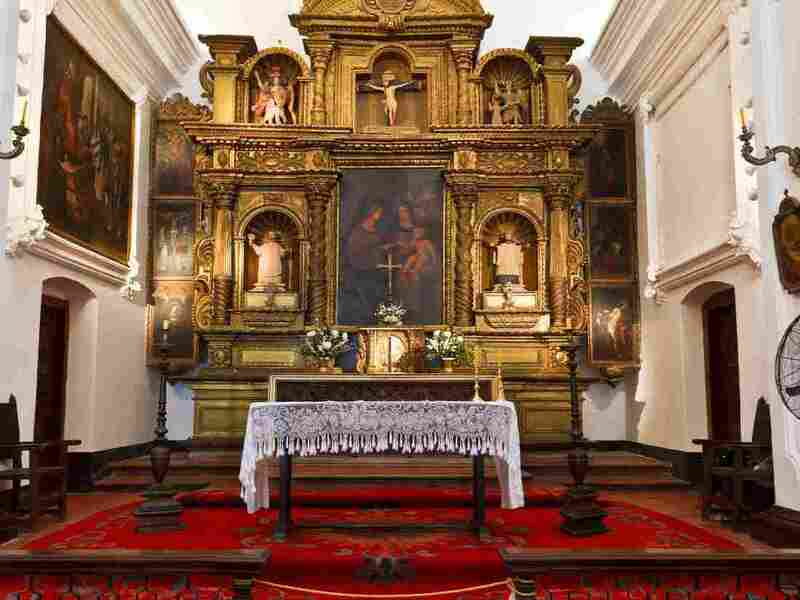 Jesuit Mission in Santa Catalina in Cordoba in Argentina. Cardinal Jorge Bergoglio's ascendency to Pope Francis has suddenly placed his Jesuit order in the spotlight. Francis' papacy is the first for a member of the Society of Jesus, which was founded in 1540 by the Spaniard St. Ignatius of Loyola and has grown to become the single-largest Catholic order, playing a central and occasionally controversial role within the church. Today, some 20,000 Jesuits, about three-quarters of them priests, work in more than 100 countries and are best known for the schools and institutions of higher learning they administer. Over the centuries, the Jesuits have founded hundreds of missionaries, schools, colleges and seminaries around the world. Members take vows of poverty, chastity and obedience and are sometimes referred to as the "pope's marines" because they swear a special allegiance to the pontiff and agree to accept religious orders anywhere in the world, even in extreme conditions. "The first Jesuits made their mark as preachers, convent reformers, and missionaries, but in 1548 the Jesuits opened their first college intended for lay students at Messina in Sicily. It was an instant success, and petitions for more Jesuit colleges flowed into Rome from most of the cities of Catholic Europe. "Quickly, education became the main Jesuit ministry. By 1579 the Jesuits were operating 144 colleges (most admitted students between twelve and twenty) in Europe, Asia, and Latin America. By 1749 the Jesuits were staffing 669 colleges and 235 seminaries world-wide." "The main mission has always been very flexible, and it has been to do anything for the greater glory of God," says the Rev. James Martin, a Jesuit, editor at the Catholic weekly America magazine and author of The Jesuit Guide to (Almost) Everything. "Here I am a journalist at a Catholic magazine," he observes. "I have Jesuit friends who are prison chaplains, writers and teachers." Reflecting a tradition of scholarship, many Jesuits have also been scientists and mathematicians and have served as astronomers at the Vatican Observatory. But the Jesuit order has been no stranger to controversy, both within and outside the church. The Jesuits' loyalty to the pope drew them into European political intrigues at the time of the Protestant Reformation and the so-called Counter-Reformation. In the 18th century, the Jesuits had become so influential in European courts that Pope Clement XIV moved to suppress the order. In the 1970s and '80s, Jesuit priests in Latin America were instrumental in the promulgating of liberation theology, which interprets Jesus' teachings as aimed at redressing economic, political and social repression. Pope John Paul II and his successor, Benedict XVI, actively discouraged the movement, and in 2007, the doctrinal office of the Vatican criticized the "erroneous or dangerous" writings of Spanish Jesuit scholar Jon Sobrino, saying they "may cause harm to the faithful." Ballecer calls the ascendancy of Pope Francis the "realization of something we thought would never happen." Martin adds that while Jesuits are supposed to pray for humility, on hearing the news of Bergoglio's election to the papacy on Wednesday, he was "[as] delighted and proud as a Jesuit is allow to be."